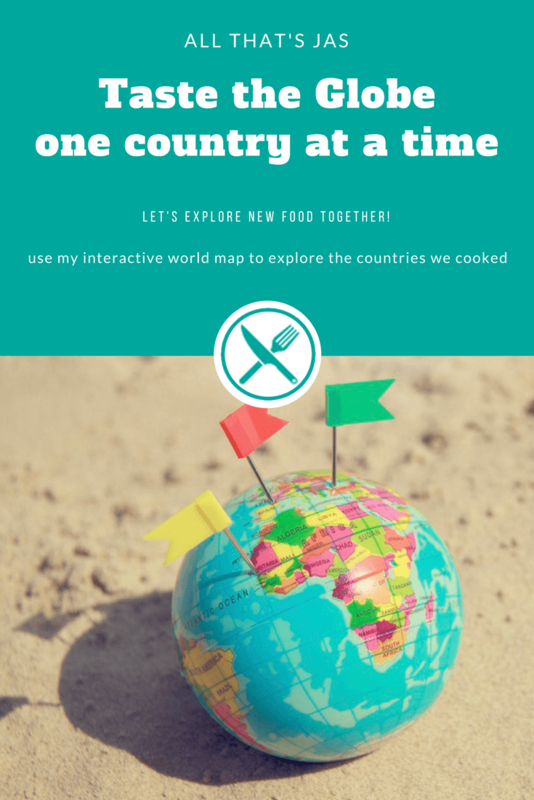 In my quest to simplify recipes from around the world, I discovered that it is quite easy to taste the globe. The base for all dishes is spices and herbs. They make it easy to explore the culinary world from your own kitchen. It really is as simple as that. Life is too short to eat peanut butter and jelly! Be adventurous – try new food! Surrender to tongue-tingling flavors and explore cuisines diverse in variety and taste. Submerge fully into magical spices and titillating food experience. You will never look at food the same way again. Variety is the spice of life and is healthy for you, too. If you can’t travel, bring the world to you! Use this interactive world map to explore the countries we cooked on All that’s Jas. To begin your tour, simply click a pin and then link to all recipes from that country. You can also use the search box at the top of the page to find exactly what you’re looking for. View Taste the Globe in a larger map.